The timing of the contest announcement caught us by surprise, so we weren't able to confirm out involvement immediately. But yes, the contest is legitimate and The Dark Mod is a part of it. This FAQ is based on the information I was given in conversations with Square Enix. Not all of it has been reflected in the contest rules posted thus far. Until it is confirmed in writing, you should accept this information at your own risk. Why is The Dark Mod involved? 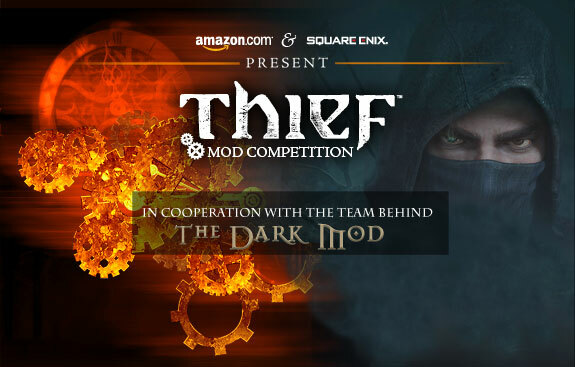 The Dark Mod was born in the Thief community, and was created and supported by Thief fans. If something is good for the Thief community, then The Dark Mod is happy to be a part of it. And what could be better than something that celebrates the terrific talent and passion of mission authors and modders (not to mention giving them cool prizes)? It's also nice to have The Dark Mod officially recognized by the owners of the Thief franchise. Can I enter a mission for The Dark Mod into the contest? Yes. You can use any Thief platform (T1, Thief Gold, T2, TDS) as well as The Dark Mod. If you're entering the "If I Could Mod, I Would Create" category, you don't even need to use a platform at all. Just share your great idea! Do I have to use Thief: Gold for the contest? No. You can download Thief: Gold for free, but you don't have to. Even if you download it, you don't have to use it for the contest. Consider it a free gift from Square Enix. Why can't people outside the US enter? I agree that's unfortunate. The Thief community is world-wide. As far as I know, the limitation is due to the involvement of the US division of Amazon, who is providing a lot of the prizes. It seems that different divisions of Amazon support contests only in their own regions. There may be future announcements on this point, however. So can I use The Dark Mod to create a Thief mission? The Dark Mod has always been careful not to use any IP belonging to Square Enix. However Square Enix has agreed in conversations with me that they are allowing people to use Thief IP in The Dark Mod for the purposes of the contest. However, until this information is reflected in writing we will continue our policy of not endorsing, supporting, or hosting TDM missions that use Thief IP. Note that you can enter the "If I could mod I would create" category without creating anything at all, so copyright questions would not apply. So how do I enter the contest then? You don't have to download Thief: Gold. First, you should decide which category you want to enter: "Look, I made a Mod" or "If I could Mod, I would create". If you're doing the second one, all you need to do is make a short video pitching your cool idea. The more creative your pitch, the better. If you're entering the first category, then you need an actual mod/mission to showcase in your video. Can I enter something I have already done? Yes! You do not have to create something new for the contest (although you can). The contest is to celebrate the talent of the Thief community, and that includes things that have already been created. We'll need to wait for more details about this. I know Square Enix originally wanted the community to vote for the winners, but they had to work out the details with Amazon. Some press releases are stating that The Dark Mod is involved in the judging, but this is NOT correct. If there is a community voting process then we will be a part of that, but members of The Dark Mod have no privileged role in judging (which also means we are not barred from entering, as currently stated by the contest rules). Does this mean The Dark Mod is endorsing the new Thief? The Dark Mod doesn't have an official position on the new Thief game. But my personal position is that any game that has the potential to create new fans of first person stealth gaming is a good thing for us. Well, aside from the ability to win some pretty cool prizes, your contest entry is basically a promotional video for your mod or mission. It's free advertising. And if it's a TDM mission, it's free advertising for us as well. I can try to update our Moddb site tonight unless you plan on doing it? Let's wait until the details come out today, but I'd be happy if you took care of that. So this is a US only thing right? The U.S. restriction is unfortunate. I think we should start making a list of people here from the U.S. that would be willing to enter the contest for some of the people who aren't eligible. Kind of an entry by proxy. It'd have to be some well established members here though, considering some of the prizes. Can someone enter someone else by proxy? I would think there would be problems awarding prizes, tax ramifications, etc. Hopefully we will see some new Thief Gold or TDM missions! Also, there was that version of The Trickster's mansion that was made for TDM during testing but never completed. Can that be polished up and entered? Edited by lost_soul, 20 February 2014 - 12:17 PM. Thing is, unless they extend the deadline from what it says currently, they aren't giving people a lot of time to work on their projects. End date is April 14th, which is less than two months away. Hard to get even a small mission done in that time frame. Then again, you're really only submitting a video, so the mod doesn't have to be in fully functioning order and can be released later when it's 100% working. I guess the leading contenders will be existing missions. The short timescale makes this more a celebration of what's been done as much as an encouragement to build anew. It's great to see yet more well-deserved recognition coming TDM's way. Another reason to say a big thanks to the team who've put in so much work on TDM over the years. Thanks guys! Now Komag can finally release his Thief Rebuilds! Already emailed about this, may evne help him if he dosent have enough time in RL. I thought TDM "Team Members" are excluded per the contest terms? That was an error. We were listed as judges in error and as such disqualified from entering. We were not meant to be judges however, so once that is corrected TDM members can enter. The PC Gamer article is really confusing, They call it a "Thief Gold" contest, but then go right into talking about TDM and how it was their "Mod of the Year." Weird. This contest concerns me a bit. Won't this temporary license to use Thief IP create problems down the road? How do we go back to telling people no, when nearly every entry into this contest says otherwise? I'm surprised to see you guys so quickly jump on the opportunity to contaminate the waters after all that has been done to avoid legal troubles. rich_is_bored now calls himself rich_is_concerned !! But I think that is a good point, have you guys already thought about this? Don't think there was any quick jumping going on. Do you know what's up with Doom 3 world? Won't this temporary license to use Thief IP create problems down the road? How do we go back to telling people no, when nearly every entry into this contest says otherwise? We haven't even seen the agreement in writing yet, so it's hard to say. But the license is not given to us, as I understand it; it's a license that applies to the contest. Basically, by agreeing to the contest license, you are given permission to use Thief IP, and you can use any platform that you have permission to use. We're giving permission to use TDM. From what I understand the server was compromised and the site has been taken offline. I haven't been in contact with Bernhard so I couldn't tell you what lies ahead. I know he has a growing family and has less time to devote to the site. Make of that what you will. The EULA for the comp says you can enter the competition but you can't distribute a mod containing anything that's owned by Eidos - so I guess that covers TDM/Eidos IP angle. Are you guys going to stay in touch and maybe help judge entries and whatnot? Edited by jay pettitt, 20 February 2014 - 06:32 PM. So you can create a mod for the contest using the Thief IP, take a video of it to enter in the contest...but then you can't release it for people to play? I imagine it can be released for people to play, but it would likely need to be appropriately identified as a contest entry specifically for this venture.